It was recently announced that the pirates from ALESTORM have re-signed with Napalm Records, and when they signed, they signed in rum, rather than blood or the usual ink! Before they get to work on their next pirate opus, these swashbucklers are returning to tour the United States once again. And don't worry there will be plenty of rum to be drank and partying to be had. The tour kicks off October 2nd in Greensboro, NC and wraps up November 1st in Spartanburg, SC. A complete list of dates can be found below. "Ahoy pirates of the USA! We can't wait to get back on the road for our most extensive tour EVER of your big ol' freedom lovin' country! 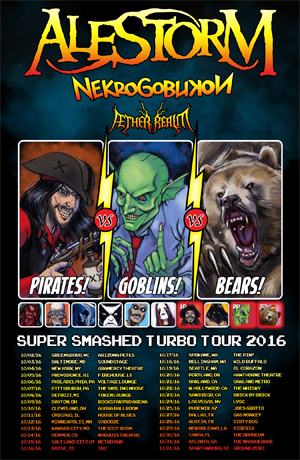 We've got NEKROGOBLIKON and AETHER REALM along with us for the ride, so it's gonna be a crazy 3-way brawl between pirates, goblins, and Thomas the Tank Engine. Prepare your livers for party time!" Don't miss your chance to drink and party the night away with ALESTORM. 10/17: Spokane, WA @ The Pin!